Over the last couple of months, I’ve been spotting mysterious 100 mL bottles of Oscar de la Renta perfumes on the $19.99 shelf at various Shoppers Drug Mart locations. Googling does not help at all—especially couple of months ago—when just about nothing turned up on these scents. I was beyond curious! The first ones I saw were Rose and Jasmine. The bottles made them look like flankers of the very wonderful Esprit d’Oscar, the brand’s younger, more modern version of their 1970s classic, Oscar. But I did not bite. Then, over the last week or so, I’ve been seeing more of these popping up! Midnight Amber! Blue Orchid! Tropicale! Online, there is brief chatter of Ruby Velvet and Orange Flower. Curiouser and curiouser. 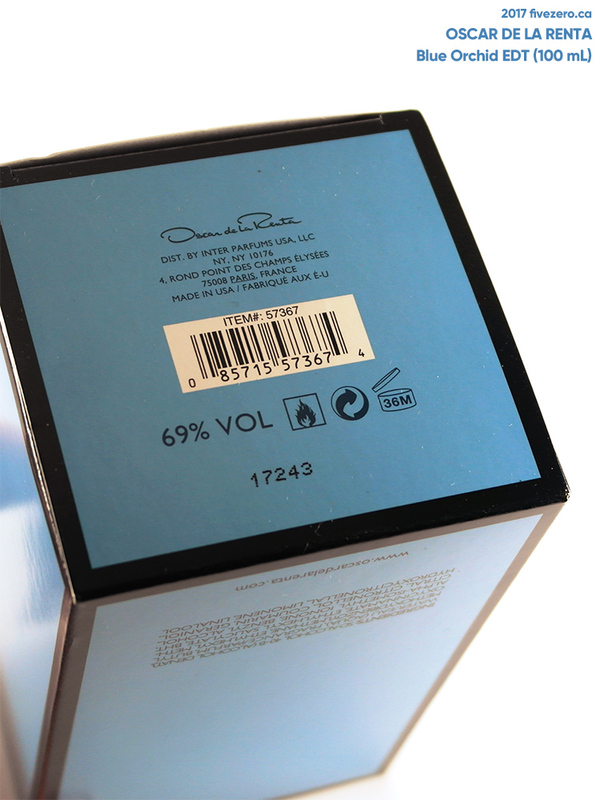 And a little less curious today, because I just picked up a bottle of Blue Orchid. I hemmed and hawed between it and Tropicale, but decided to go with Blue Orchid because I didn’t think I needed more coconut/pineapple/suntan lotion-smelling perfumes. Blue Orchid sounds more mysterious, doesn’t it? And I’m always game for a blind-buy. Well, I’ve hopefully just saved you $19.99, because Blue Orchid is pretty disappointing. And now, I’ve got this massive bottle of it. 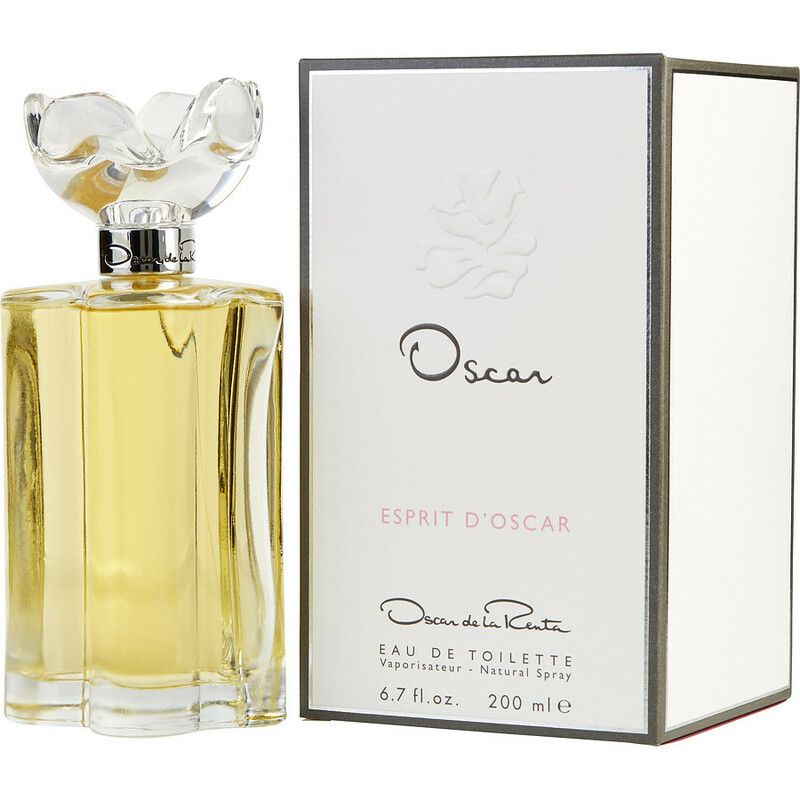 The bottle is shaped just like the Esprit d’Oscar bottle, so it is quite pretty. 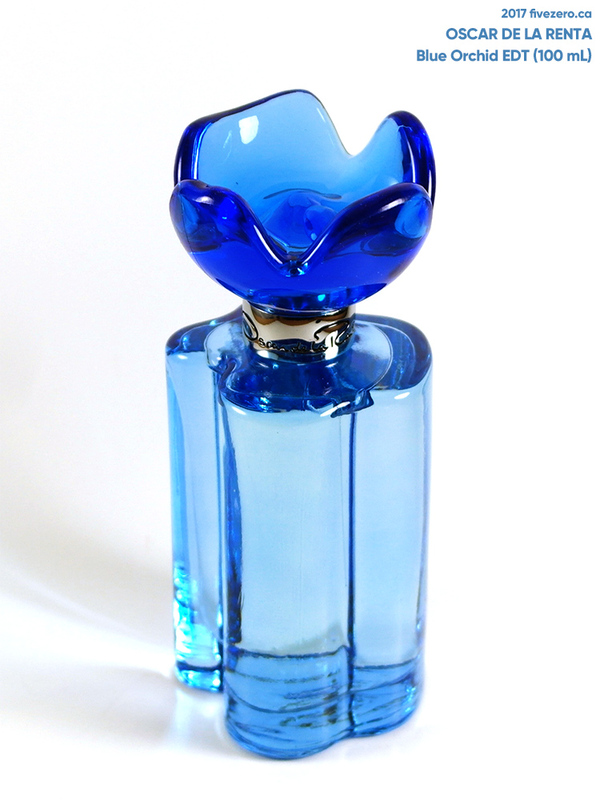 The plastic flower-shaped cap was a little loose, though—this perfume is already hinting at being a bit cheaply made. At least the glass is thick and heavy, and the metal band around the neck with Oscar de la Renta on it is quite attractive. Abercrombie & Fitch, Agent Provocateur, Anna Sui, bebe, Boucheron, Coach, Dunhill, Hollister, Jimmy Choo, Karl Lagerfeld, Lanvin, Montblanc, Oscar de la Renta, Paul Smith, Repetto, Rochas, Shanghai Tang, S.T. Dupont and Van Cleef & Arpels. At other points in time, they also produced fragrances for Burberry, Céline, Christian Lacroix, Molyneux, Nickel, Quiksilver/Roxy, and more. As for the fragrance itself, at very first spritz, I get a strong whiff of hairspray—not a good start. This very quickly dries down, thankfully, to a very synthetic citrus. It’s not as harsh as, say, the smell of a lemon cleaner, but it’s not great. After a few minutes, everything settles down to a much more manageable insipid aquatic floral that I somehow still find a little bit shrill (is it freesia? I don’t particularly like that note in perfume). The hint of citrus makes way for a musky undertone that smells vaguely to me like plastic. To its credit, the perfume does smell somewhat “blue” to me, but perhaps that’s just me being too impressionable. It’s probably just the aquatic notes. As for longevity, I don’t think this has very much. I’ve had about four or five spritzes on my arm for about two hours now, and it’s already quite faded. A blessing in disguise—ha! If I’m honest, a lot of “drugstore” perfumes smell just like this—synthetic and screechy. There are, of course, plenty of exceptions—but, sadly, Blue Orchid isn’t one of them. It’s not a terrible perfume, but I could definitely have spent that $19.99 better. Probably should have tried Tropicale, huh? I’ll just use this up as a bathroom spray. Goodness knows I’ll need it with two little kids at home. If you are also spotting these perfumes on the cheap, whether it’s at Shoppers Drug Mart or at online discounters, I’m going to give you some advice. Skip these colorful bottles—it’s possible that the others are good, but at this point I’m not inclined to spend any more on them—and go for the tried and true: Esprit d’Oscar and So de la Renta are amazing perfumes, and it’s just a delightful bonus that they are priced so well. 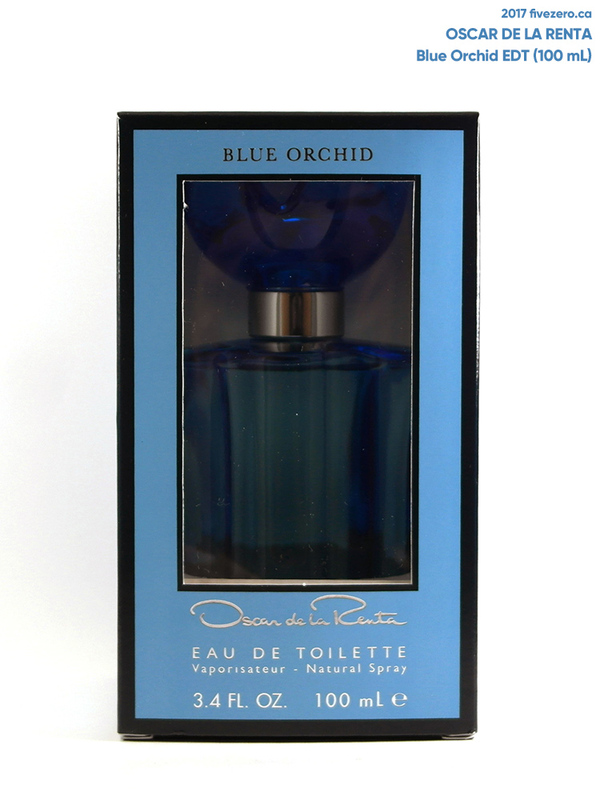 Oscar de la Renta Blue Orchid comed in eau de toilette and contains 100 mL. It retails for around CA$19.99–$30. It is made in the USA. Oscar de la Renta (1932–2014) was a Dominican fashion designer, famed for dressing Jackie Kennedy. He launched his eponymous brand in 1966; its first fragrance, Oscar, was released in 1977. I nearly caved into Tropicale at the last bonus redemption days but held off. I’m still curious about it but cannot find any information on the internet about it! Sorry yours was a miss! So now we know what blue orchid smells like huh? I’ve only ever blind bought a perfume once and it backfired hugely so I’ve never done it again! Good thought on using it up as a bathroom spray I might migrate my blind purchase the the bog! I just Googled it and apparently there is no such thing as a naturally blue orchid! (Blurple is as close as they get.) An imaginary perfume for an imaginary flower.